White hot for summer, Trixie's white-on-white check print gives a subtle texture for a demure resort vibe. 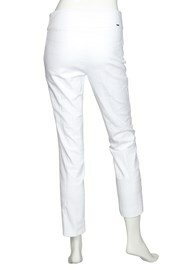 For supreme comfort and wearability, her stretch fabric and pull-waistband ensure a sleek fit. 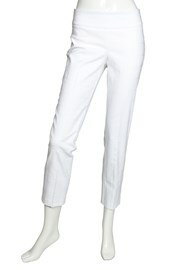 Flattering and easy to style, her 7/8 length allows elegant ankles a glimpse of summer sun. Turn garment inside out. Wash with like colours. Machine wash cold water gentle cycle. Do not bleach. Hang to dry. Iron low on reverse if needed.